I sent out these birth announcements from Minted to all my family and closest friends a couple of weeks ago but, since I'm not rolling in the dough, here it is for all those I couldn't send one to. :) I'm pretty proud of how on the ball I was with getting these out so quickly! She's such a doll and I love her. Louisa is an angel baby and we can't get enough. We're so glad that she is a part of our family! Thanks for sharing your family with us Liz. She is beautiful. I was like, "who's Frederick?" - Forehead slap. Ha ha! Fritzeepooh forever!!! I loved the announcement. Perfectly perfect just like Lou! Oh Liz, she is soooo beautiful!! 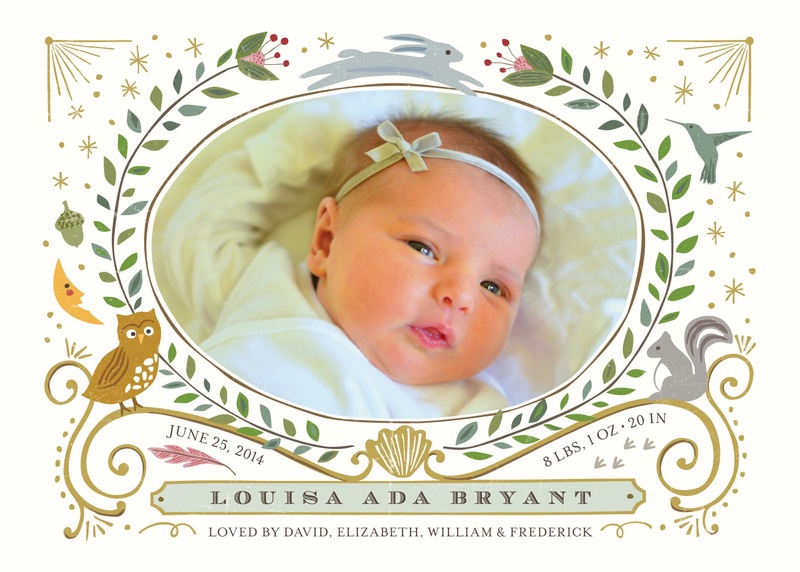 We loved receiving sweet Louisa's birth announcement. She is absolutely beautiful, and the card is perfect. I love the woodland animals. :) Give that precious girl big snuggles from us! We love and miss you guys. I will keep it forever I loved it that much...love love love it!